Feel the revolution! 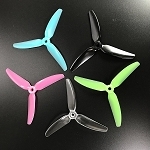 Introducing, HQ Prop's first Quad-Blade FPV Racing Propeller. Better efficiency, more thrust and smoother control, this is a must have when it comes to innovative prop technology. Comes in Tasty Orange from Propsman.com. Make sure your quad is filled with Vitamin C (just kidding). In the FPV industry HQ Props have become extremely popular. It is standard issue for some of the top FPV pilots in the world, including Skitzo, Mr. Steele and Ummagawd. 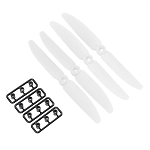 All of HQ Props are available in both normal and reverse rotation as needed for use in multirotors. The HQ Props are made with a glass fiber fill for extra strength and durability. 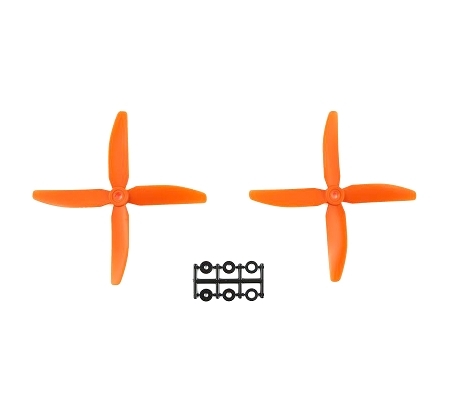 These props have an oversized center hub for extra strength that measures 12.9mm in diameter by 7.1mm thick. The hub has a slightly undersize 5mm hole molded into the front of the hub, and a 9.5mm diameter recess in the back of the hub to accept prop shaft adapter rings. Also included with the prop is a set of adapter rings which fit into the recess on the back of the prop hub to reduce the center hole to 3, 4 or 5 millimeters.